I'm just curious. I've always been kind of scatterbrained but it seems as I age, (or is it really the MS? ), I find that I can be presented with a situation and instantly read it all wrong before I'm clued in and figure out what I'm seeing. Example: Pulling in to the bank parking lot, heading for the drive-thru lane. On my left is the bank building surrounded by landscaping. On my right is the parking area. From the right comes a short, squat yellow vehicle with no top, yellow/orange metal framework, 4 big tires and someone behind the wheel. Immediately I see this as someone in a go-cart heading for the drive-thru lane. Just as I was about to open my mouth and give away the fact that I'm clueless by saying "Hey, look at that! I've never seen a go-cart go through the drive-thru before!" I catch myself. Within seconds he finishes crossing the parking lot and is either doing donuts in the grass around the building or what I thought was a go-cart is actually a lawn mower. It seems like my perception of things, at least for the first few (sometimes critical) seconds can be way off from reality. It disturbs me sometimes. Is it MS, or is it age? Or is it just in my genes? Mom, who was sitting beside me, thought it looked like a go-cart, too. I just wonder... how do we know if MS is affecting us mentally? I know about the "crying when you're supposed to laugh" and vice-versa stuff, but I'm not really sure about the subtleties of perception. 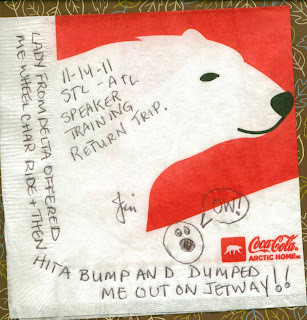 I hadn't flown in nearly 30 years and when I flew to St. Louis for speaker training for the Gilenya Guide Network, I saved the napkin from the first leg of the flight. I had forgotten all about my napkin collection I'd had as a child. I wonder if it would be worth anything now if I had saved it? 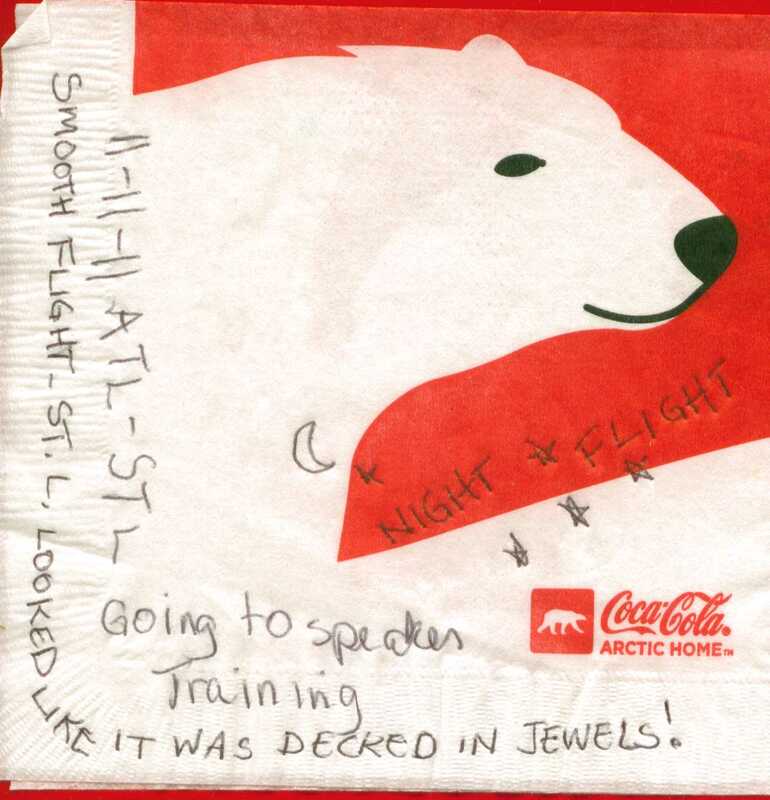 I collected a scrapbook full of napkins from trips my parents took us on. Every flight, every restaurant. It was a cool way to remember the fun times. 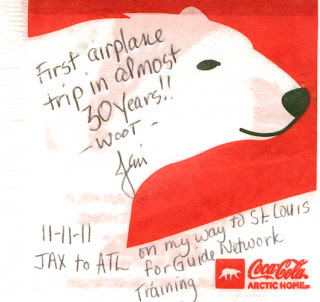 But I parted with the collection at age 12 when we moved aboard the boat and never gave it another thought until 11/11/11 when I was flying from Jacksonville, FL to St. Louis, MO. I got 2 napkins with my drink (I'm sure, quite by accident) and so I scribbled the date and flight on the white part of the extra one to save as a token from my trip. Something slowly dawned on me. The spark that was the fire. I remembered my collection from my youth suddenly and realized it would be a great way for me to chronicle my experience as a Gilenya Guide. For those of you who don't know, there are events happening across the country where MSers and their families, friends and caregivers can go to learn all about Gilenya and ask questions of the doctor who gives the presentation. Many of these events will feature one of the real life patients who have been on Gilenya and have been invited to travel and share their stories. We are trying to spread the message of empowerment. "Take control of your own MS and be your own advocate." is pretty much what I tell people. So this is going to be quite an adventure for me. 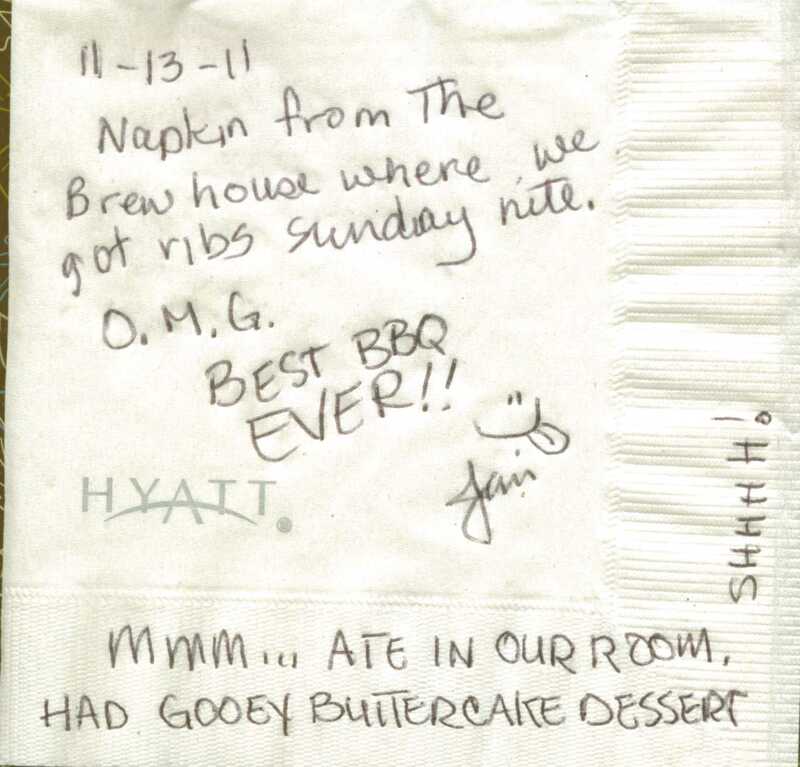 And I'm going to bring you along one napkin at a time. Here are the ones I have so far -- in chronological order. I was terrified. My poor sister, who accompanied me, probably still has bruises on her forearm from my white-knuckled grip. Second flight, I was a wee bit more relaxed but not totally. I did get to see that St. Louis looked lovely in her sequined evening gown and jewels -- or so it appeared from the night sky. At introductions I was so nervous all I could hear was my own heart pounding in my ears. I told them I am so shy about public speaking that I can't even talk to my own family at Thanksgiving dinner. I finally got going, describing my MS journey and by the end I was recounting how I used to have to use canes or a walker. But then I started crying. Everyone clapped. Someone brought me napkins to dry my eyes. Naturally, I kept one. 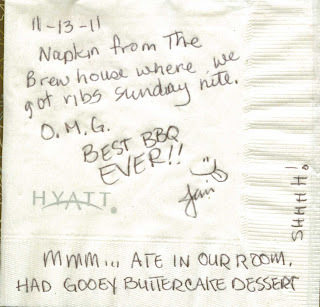 Note: Susan K. we tried to find you when we found out Pappy's was closed but apparently I never got your number. Duh. Sorry! Monday morning I was back to having pre-flight jitters. I had already learned that walking through airports with an overstuffed carry-on and leaning to compensate for it while using a cane is awkward and tiring. I never have to use my cane day-to-day but decided to take it for the extra walking involved in travel. A Delta ticket agent saw me with the cane and asked if I wanted to pre-board and she offered me a wheelchair ride down the jetway (see Anne? I remembered the word. :P) She ran me down the jetway (actually saying "vroom" as we took off with the chair). Then we got to the little ramp where the jetway telescopes and she said "little bump!" right before the wheels stopped dead and suddenly I flew through the air. I landed on my cane, crumpled in a heap. She freaked out and helped me up saying I must have been dragging my feet. Uh, no, sorry. Totally your fault, not mine. I now have a huge bruise, but all in all it was no big deal. The flight was otherwise beautiful and I was able to relax and channel my inner child who used to love flying and collected napkins with glee. So that's how this new chapter of my life is shaping up so far. 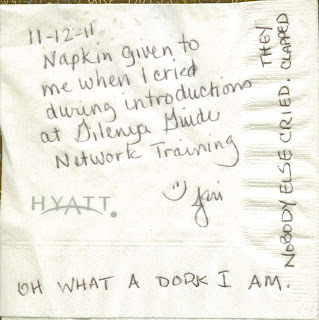 More napkins to come as my first speaking engagement is scheduled for Athens, GA on 1/2/11. If you're in the area, come on out! 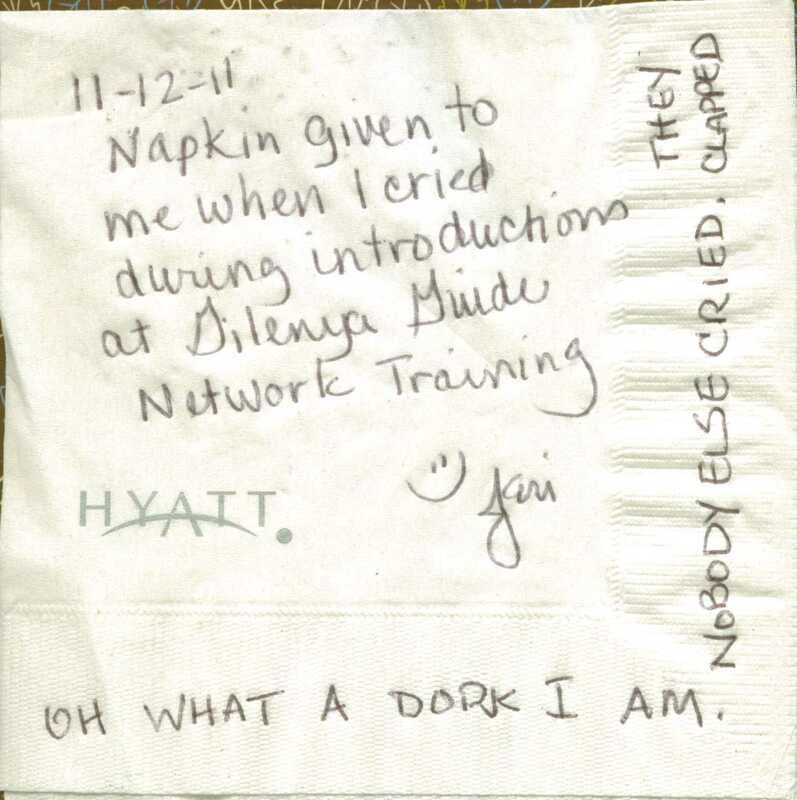 As a lot of you know I just went through training to become a Gilenya Guide (patient speaker). This means I will be traveling around telling my MS story and Gilenya experience at different events where Gilenya is presented. There will be a physician who gives a slide presentation to groups of MSers and their family, friends and caregivers along with a real live patient on Gilenya (me) and a nurse provided by Novartis to moderate the meetings. Question and answer sessions follow. This is a great way to get informed about this new drug and be able to have face time with a doctor who will be able to answer all your questions. I just got my first speaking event! It will be in Athens, Georgia on December 2, 2011 at Etienne Brasserie. It will begin at 11 a.m. I am so excited and if you want to come out and get informed, I'd love to see you there! Just so you know, I wear many "hats" in my life and my blog is totally separate from this speaking experience with Novartis, so if you do come, this blog won't be the topic -- nor will it even be mentioned. It's not the point of the event. I'm just so happy to be able to share with a greater audience this way and reach out to MSers who might be struggling with their current therapies or may be feeling like they have reached their wit's end. I just want to let you know that there IS hope and things CAN get better. They sure did for me. While everyone's experience is different, granted, and Gilenya may not work for you, you have to take charge and advocate for yourself since it's your life you're living. Know what I mean? There's nobody who knows your struggles better than you do yourself. So no matter what you choose to do, keep having that dialog with your doctor and keep trying until you find something that works for you. Trust me. Read my blog. Been there, done that. In a nutshell: Just don't give up. What an amazing time I had in St. Louis. Loved seeing the sights and meeting so many inspiring, wonderful people. You know who you are. 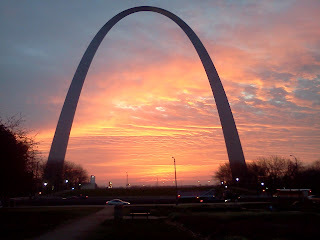 If you are here reading this and you were in St. Louis this weekend, YOU are the wonderful, amazing, inspirational, uplifting person I am talking about. ALL of you. Anyhow, if you were in St. Louis and would like to stay in touch, be sure to leave a comment on this post with a way to contact you. I neglected to get about 1/2 of your phone numbers and was disappointed to see that certain folks weren't in there. If you do leave a comment rest assured I will not publish them and I will respond via email. It was just too great an experience not to keep in touch. And if you weren't there and you have no idea what I am talking about, I think it's safe to say we were all a group of patients attending training to become patient speakers for Gilenya. Sorry, but I'm not going to go into detail about what that entailed but I may touch base on some funny tidbits to share with you of my travels. I'll leave you with one. 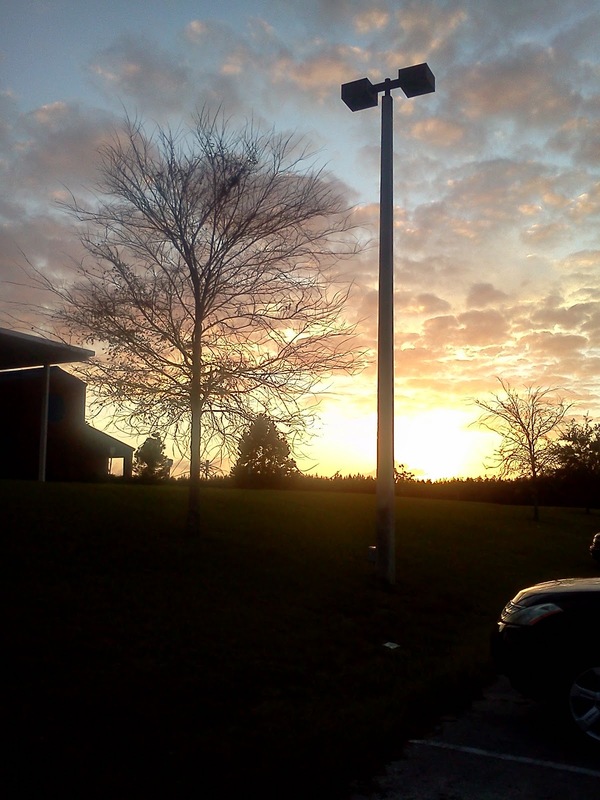 Friday, 11/11/11, was the first time in roughly 30 years that I flew. The second leg of the trip was from Atlanta to St. Louis. I had a center seat with two big burly guys on either side. The guy on my left was reading Hemingway's "For Whom The Bell Tolls" and was a couple dozen pages from the end. The guy on my right was fidgety and listening to his ipod and wearing corduroy pants. It was all I could do not to lean to my left and say "It tolls for thee," or lean to my right and ask "are you wearing those in honor of 11/11/11?" Ok, maybe not the greatest jokes, but I was paralyzed with fear so forgive me. When we touched down and bounced a little, I was muffling a scream. The book reader guy was yawning and I said "REALLY?? You're yawning and I'm trying not to scream???" And he just chuckled. On the way home, somewhere between Atlanta and Jacksonville, I found myself either relaxed enough or exhausted enough to finally yawn a few times myself. And with that I leave you. I'm going to go hibernate for about a week. And think about all the fun we had. One of the qualities any hypochodriac who's worth their salt possesses is the ability to vividly visualize any given situation in the near or distant future and predict a negative outcome. I have always been good at this, having learned from Master Of The Hypochondriacal Experts Reknown (henceforth referred to as MOTHER). She is not only a medical worrier, but has widespread fears in general, perpetuated by a vivid imagination that chooses to visualize the inevitable negative outcome of any given situation. For instance, if it's cloudy out and I'm about to walk out the door, she suggests an umbrella and tells me to leave 15 minutes earlier than planned. According to MOTHER, the clouds mean that a nasty storm is about to unleash it's wrath on me simply because I choose to leave at that moment. This will be a storm that blindsides the weather guy who never knew to warn us. It will bring trees crashing down on the roadways, cause visibility to be negative 4 feet (so I can't see anything but the back seat when looking out the front windshield), and I will not reach my destination without facing many perils. Why, that storm could fill the drainage system and cause alligators to rise up out of the swamps to nip at our heels if we step outside. Likewise we shall be accosted by snakes. All this goes on in her head because of the "What-If" mentality. This same visualization could be put to better use envisioning a positive outcome, but if something does go horribly wrong we wouldn't be prepared for it. Instead, both MOTHER and I choose to pre-live every horrible situation in life and fret about those things which are out of our control rather than face things the way normal people do. I imagine normal people leave the house on a cloudy day never knowing they are about to be crushed by a tree in a blinding rain storm. If only they had taken that umbrella. There is really no way to stop this ingrained internal conversation. It's in my DNA. It's that voice inside my head that narrates my daydreams. It's the voice that argues the what-ifs with my somewhat shyer, less assertive, newly acquired Voice of Reason. This Voice of Reason is a new voice that I have found. It has lain dormant in my soul, letting the Voice of Irrationality who has had the podium for lo these many years always take center stage. But I'm encouraging this Voice of Reason. Trying to let myself know that it's not so bad to think positive. Case in point: I have suddenly found myself about to fly on a commercial airline for the first time in nearly thirty years. I never considered that I would ever be flying again as I had no plans to go anywhere and did not anticipate that I might win a trip or something (I was too busy, preoccupied with negative outcomes to entertain anything foreign like that). So when I was invited to become part of the Gilenya Guide Network, I had to come to terms with the idea that this is going to mean flying. Not once, not twice, but on a regular basis for the next year. I will be a patient speaker at MS meetings where Gilenya is being presented. I will be the voice of the real patient who has been on the drug and lived to tell. I can show others with MS who might be considering the drug that look! I haven't grown a third eye or gills from taking it. But this necessitates flying. 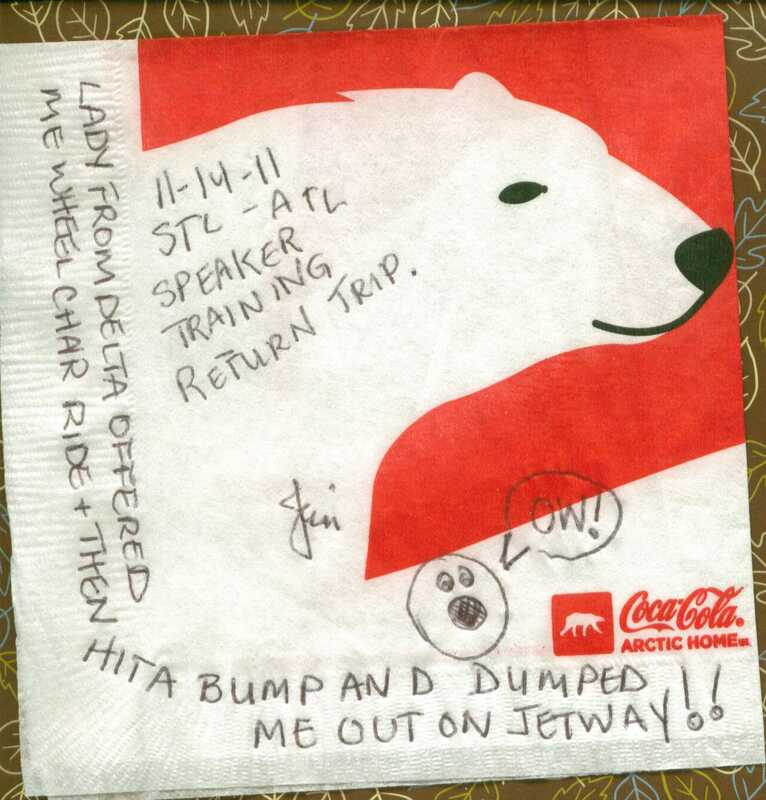 My first flight is going to be this Friday as I head off to Speaker Training taking place in St. Louis, MO. for the weekend. I have known about this for a couple months and have dealt with it in many ways over that time. At first, knowing it was a ways off in the future, I placed it on the back burner where it was a simmering worry that never really took shape but just sat there like a bubbly black mess in a sticky pot that sometimes gave off a foul odor that would waft up into my conscious thoughts. But as the date has come closer, that pot has shifted place to be on the front burner. I have to deal with my apparent fear of (or at least strong anxiety about) flying. It's crazy. I was practically raised at a small airport until I was 12. My folks owned a 1/4 share of a Cessna 182. Dad and Mom (yes the same one who is referred to as MOTHER in this post) both earned their private pilot licenses in that plane. We went up flying a LOT. I can remember one of the most beautiful sights from my childhood was in that plane, looking out the window at the hills of western New York as the autumn leaves were ablaze in red, yellow, orange and gold below me. It was nothing less than spectacular. But I was 12. I hadn't yet developed my inner hypochondriacal worry wart. I hadn't given voice to my innermost irrational thoughts. I was unencumbered by that demon. So unencumbered was I, that I was able to go up in a T-6 WWII training plane owned and flown by my parents' friend, Ralph Twombly, and do barrel rolls, backwards loops, cork screws and stalls while laughing gleefully at the ground beneath my head and the blue sky at my feet. I felt more alive at 12 years old than at most other times of my entire adult life. 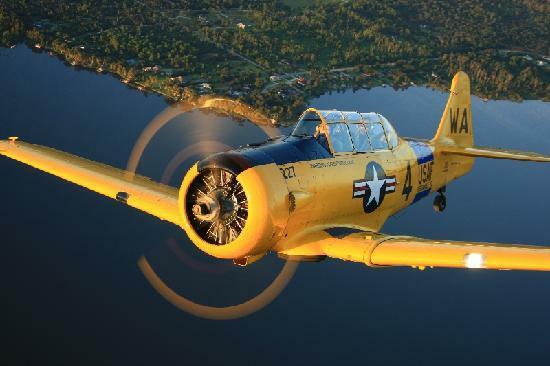 Here's a picture of a T-6 trainer -- not the exact one I flew in, but the only difference was the color. The one I flew in was red and white. So here I am, certainly no stranger to the air, worrying about every little thing. Until yesterday. I was picking my son up from his return from a school field trip out of town, and we had to pass by the local airport. It was sunset and the sky was golden. Here's one I snapped while sitting in the parking lot waiting for his bus to come in. As we passed the airport I caught a glimpse of a Cessna much like Dad's that was backlit by the sunset. I suddenly remembered how excited I always got right before we flew. It was exhilaration, not anxiety, that I remember feeling. And I want to feel that again. I took that moment to be a sign. A sign that I need to start listening to the child within that remembers life before worry. Anticipation without fear. A feeling that anything is possible and that it's okay to pre-live a happy outcome. So I say to all you fellow worriers out there, and you know who you are: Next time you catch yourself imaging the most awful of horrendous tragedies in your head, give equal time to the What-If thought that maybe something exciting and happy and pleasant awaits you. You never know, you just might be surprised. It's just starting to dawn on me that maybe the inner voice that speaks to you actually guides you to your destiny. And depending on what tone that voice is using, your outcome can either be positive or negative. And if I had let that worrier voice freeze me in my tracks, well, then there's a road, a path, I would never know. Just maybe there's something great waiting at the end. I can't let that Voice of Irrationality hold me back. Of all the terrible outcomes I have pre-lived in my imagination, not one of them have ever come to pass. This will be the last post before I go, but I'll be back to tell you all about my trip. There's going to be plenty to blog for sure!